BRCA1: Chr17:41,196,311-41,277,500; exons covering all transcripts; 7,390 bp. BRCA1 and BRCA2 are tumor suppressor genes that are associated with hereditary breast-ovarian cancer syndrome. High risk mutations significantly increase the risk of developing breast, ovarian, and certain types of other cancers. The average woman has an approximately 12 percent risk of developing breast cancer throughout her life. Five to ten percent of breast cancers are considered to be due to BRCA gene mutations. 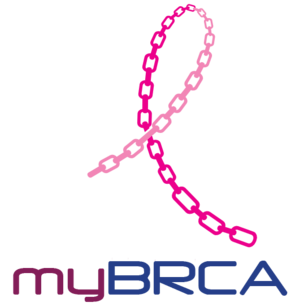 BRCA1 and BRCA2 carriers have a 5x greater risk of developing breast cancer and a 10-30x greater risk of developing ovarian cancer compared to non-carriers. Results are most informative when an unaffected relative or non-tumor sample is submitted for parallel analysis. MLPA is a technique designed to detect mid-scale deletions in genomic sequences. Genomic DNA is hybridized to an oligonucleotide pool comprising multiple probes for a target gene. 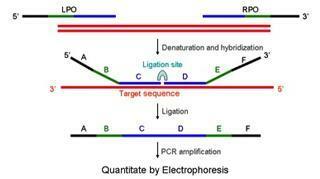 A single probe consists of two oligos which recognize adjacent sites on the DNA. Only when the two probes are hybridized to their respective targets, can they be ligated into a complete probe. Each complete probe in the assay has a unique length such that following PCR amplification, the probe products can be separated and identified by capillary electrophoresis. In this manner, MLPA facilitates the amplification and detection of multiple targets with a single primer pair. By comparing the peak pattern obtained on a sample with that obtained on various control samples, the relative quantity of each amplicon can be determined. 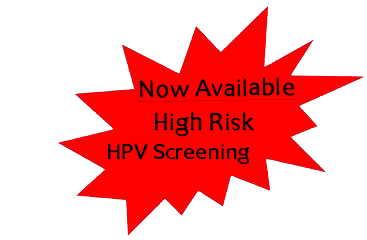 High Risk HPV Screening: Cervical, Oral Cancers.